Search and apply for the latest UK and global actuarial vacancies for qualified, part-qualified and student actuaries. 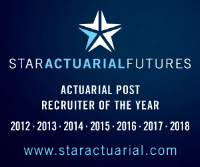 Start your actuarial job search today! Register your actuarial vacancies and reach one of the largest pools of actuarial candidates on the market today. Unique opportunity for an experienced GI Actuary, preferably with Reinsurance experience, to lead a small analytics team within a leading Lloyd’s Insurer. A non-traditional role, you will take responsibility for the development of the risk aggregation framework, assisting the business in understanding its risk profile to effectively manage associated deliverables. A high profile role within the business, your communication and presentation skills must be first rate as will be dealing with senior stakeholders including Execs, Board and regulators. Copyright © 2019 Actuarial Post. All rights reserved. No part of this site may be reproduced without our permission.